Despite a horrendous spell at work last week, I managed to finish 16 figures and one artillery piece. I think this increase in production is a subconscious way of sticking two fingers up at the credit crunch: no matter how busy I am at work I'm not going to let current circumstances interfere with my painting. Or something like that. So von Lossberg is finished, with only basing and flags to do (full pics on Friday, I hope), and I have started on the Hessian artillery. The extra 4 figures I sneaked in are the command base of the British 3rd Light Infantry Battalion. This morning I fired off an order to Messrs Perry for the rest of the unit, together with another pack of highlander grenadiers and one or two other things. The aim is to have all the Hessian stuff finished by the end of the month, to be followed by the lightbobs and then the grenadiers. Finishing the Lossberg, at 24 figures the largest unit I have to do, is to jump the first major hurdle of the project; and completing the unit in 13 days isn't bad, really. Above are a photo of the finished regiment and other bits and a close-up of the Lossberg command stand's back row. The Hessian artillery and British light infantry are not as complicated to paint as the Hessian fusiliers, which is good news now that my painting time is being squeezed at both ends of the day. Maestro Woodward will not be impressed to know that I have found myself starting at 7am rather than (the only marginally more impressive) 6.30am, now that rosy-fingered dawn takes longer to appear. I will lose next Saturday as I am on a stag do all day, and given that it's with a bunch of barristers I expect I won't be in a condition to paint much on Sunday. But 8 artillerymen and 1 gun should be do-able by next Monday. 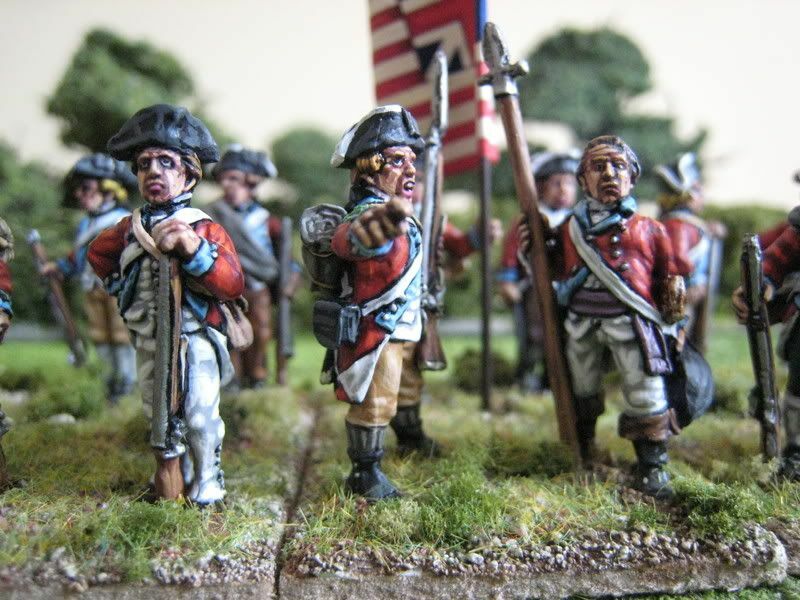 Once the Hessian brigade is finshed I will give a thought to the American brigades I need to put together, perhaps seeing if I might have time to get to work on Smallwood's Marylanders. Clinton's wing at Long Island included a brigade of 4 grenadier battalions under the command of Major General Sir John Vaughan. 3 of those battalions (at least) will feature in the Long Island game and I thought it might be nice to add a vignette of officers to go with them. Such a vignette would come in handy for other larger battles which featured a brigade of grenadiers. 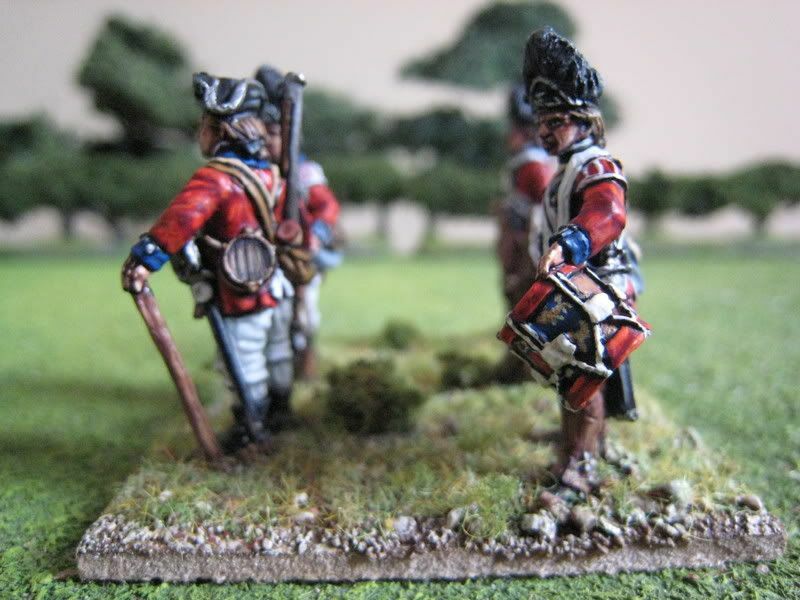 I had bought the Perry standing grenadier command pack on a whim a few years ago. 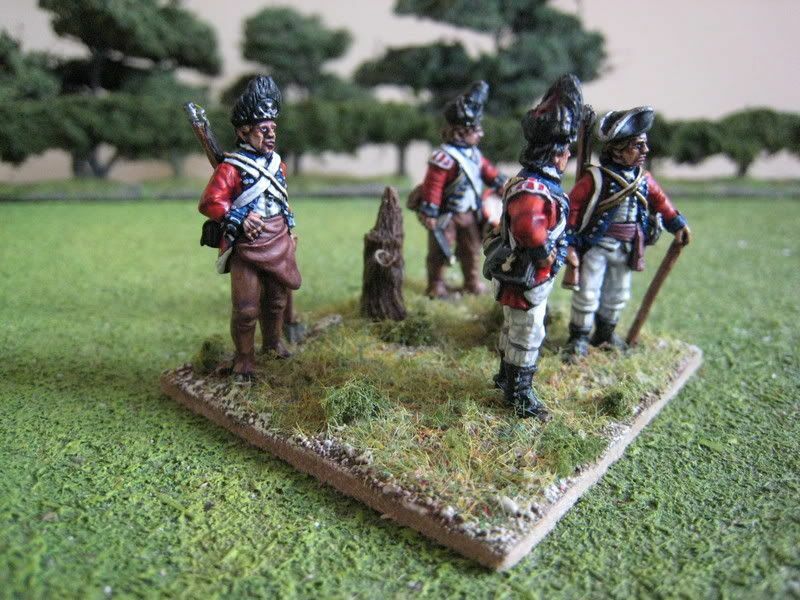 One of the officers found his way into my Cornwallis command stand but I left all the others in the spares box. So this is the balance of the pack, save for one of the drummers. I originally planned to base them all on quite a large coaster-shaped base, with some fencing in the background. But I realised that a base that size would be much bigger than the proper brigade and divisional command stands and this did not seem right. I tried to find the regiment (if any) of which Sir John Vaughan was colonel, but had no success. 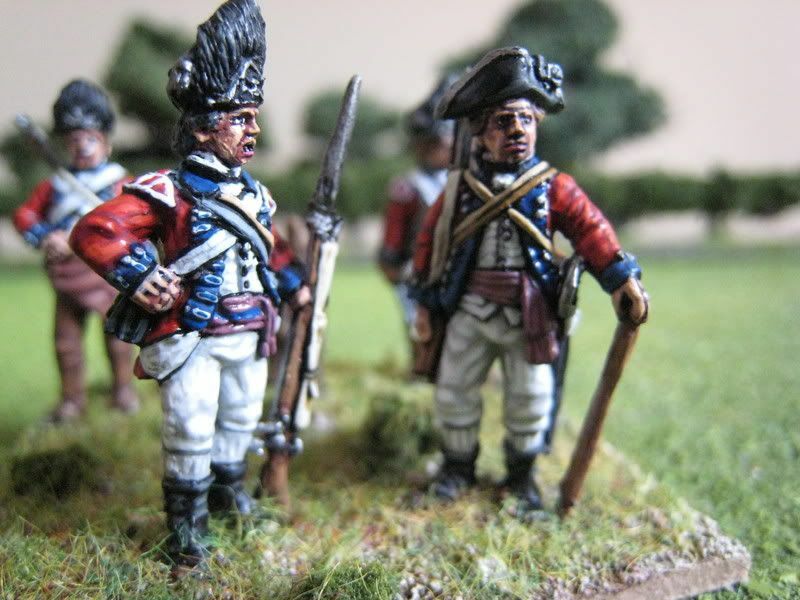 Therefore the figures wear the uniform of the senior regiment in the brigade, the 4th Foot, whose grenadier company was in the first battalion. Mollo has an illustration of a pioneer of the 59th Foot who has a red front on the cap, but the text does not explain whether this was a pioneer distinction or particular to the regiment. I ignored this and kept the cap as close as possible to the grenadier mitres, mainly to help the group to blend in with each other. 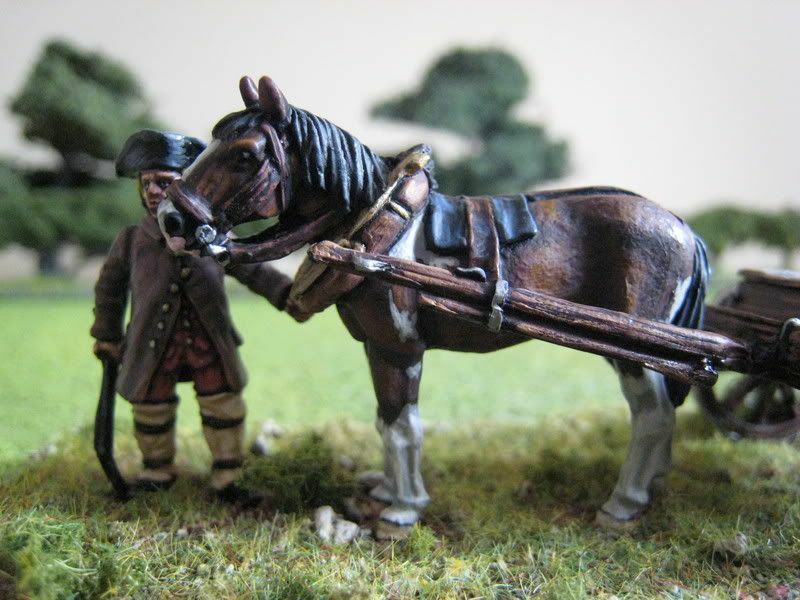 The officer is not supposed to be Vaughan himself, as I will have a mounted general figure as the official brigade commander for morale purposes etc. Here is a potted history of Sir John Vaughan that I found from sources on the net. At the time of Long Island he was newly promoted, having been Major General since 1 January 1776. He was involved in Clinton's Charleston Expedition in June 1776, then participated in Long Island and was wounded at White Plains in October 1776. He returned to England for winter 1776-77 before returning to the Americas and being promoted to Major General on 29 August 1777. He led the assault on Fort Montgomery on 6 October 1777 and then commanded troops on raids up the Hudson. He captured Verplanck's Point on 1 June 1779 and returned to England later that year. He was named Commander of the Leeward Islands in December 1779. He led an unsuccessful attack on St. Vincent 1781 but captured St. Eustatius in February 1782. Whilst in the West Indies, Vaughan appointed a certain Captain Thomas Picton as his aide-de-camp. 4 figures. Painted August 2008. Tree-stump by Redoubt Miniatures. I am now half way through the Lossberg fusiliers. I started these last Monday and as at Sunday afternoon had the first 12 finished. I had forgotten what a total pain it is to paint Hessian drummers. I have made good progress with the next batch of 6, which I will start "blacklining" tomorrow morning with a view to having them finished on Thursday. I can then get ahead a bit on Friday with the last batch of 6 figures. 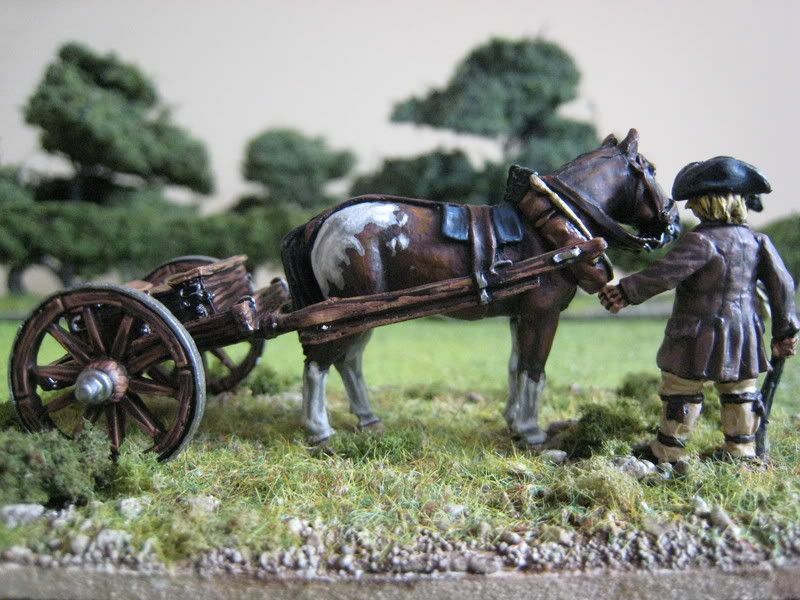 That leaves next week for the Hessian artillery, and by the end of the month the Hessian brigade should be finished. 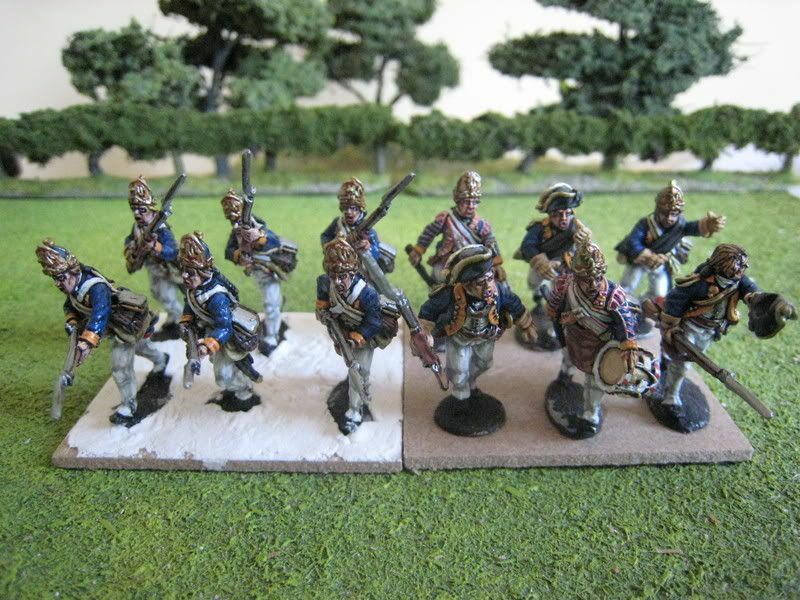 I have also managed to sneak in a couple of extra figures, namely an officer and musician for the 3rd Light Infantry battalion. I was heartened to be reminded how quickly one can paint Brits in roundabouts and slouch hats. 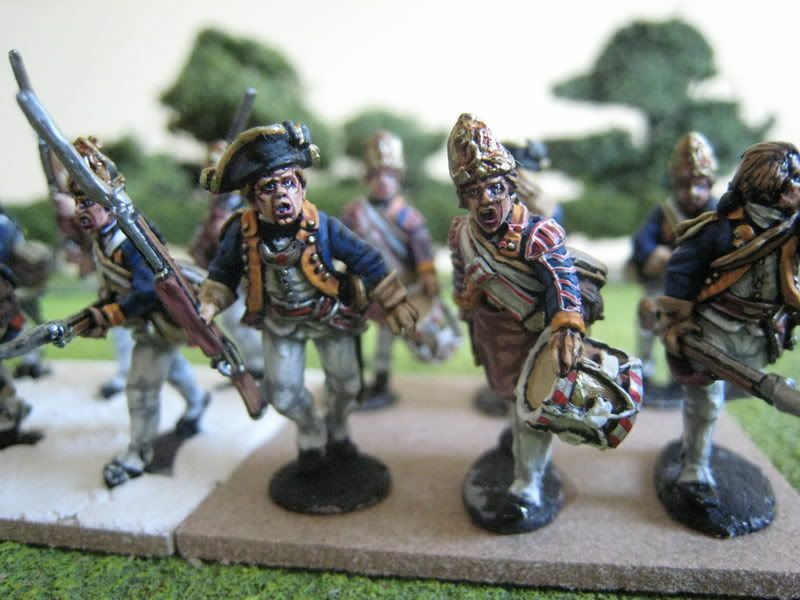 So I'm currently on target, and to be honest it's good to be painting Hessians again - they do look good en masse. The photos above are wip shots of the Lossberg fusiliers. Oh, and I need to finish that unit of militia! I can't remember how I came to buy 2 of these carts, but they are nice little sets and I don't mind having a pair of them. They will both make an appearance at Long Island. I had intended to place all 3 foot figures on the one base, but there wasn't really enough space. The horse is supposed to be a "bay tobiano". Here is what an internet site has to say: "Tobiano is a pinto pattern caused by the T gene. It's a dominant gene; TT and Tt are tobiano, while tt is not. Tobiano can be distinguished from other pinto patterns because a tobiano horse has white that crosses its spine somewhere between the withers and the tail (topline), as if the white had been poured on from above. Tobianos also almost always have white stockings on all four legs; often the white socks blend into the white on the body. A solid-colored leg on a tobiano is almost unheard of." I'm quite pleased with the way the horse turned out, and I think the pink muzzle (which I saw on a couple of other photos) adds a nice splash of bright colour to the face. When I first received the orbat for Long Island I was carried away on a tide of enthusiasm and wrote of great plans for what I would prepare specifically for the game. Nine days into September and reality has kicked in - the putative painting target I set a week ago is clearly unworkable and already I am paring down what I intend to paint up; I simply will not have time to paint everything I would have liked. So I have decided that the three extra British regiments will have to go, and I will need to find substitutes. I will not paint up Smallwood's Marylanders, but I think I can piece together a regiment in hunting shirts from those Carolina regiments I painted a couple of months ago. The regiment is recorded as wearing tan/brown hunting shirts with officers in scarlet faced buff coats. Rather than paint this 24-figure unit from scratch, I should be able to paint up a 4-figure comand stand in uniform coats. So this leaves to be painted the Hessian Lossberg Fusiliers and 2 gun crews, a light infantry battalion and a grenadier battalion - much more manageable and this should also leave me some time to paint up a couple of vignettes and other stuff that one would expect to see havering around a game of this sort. 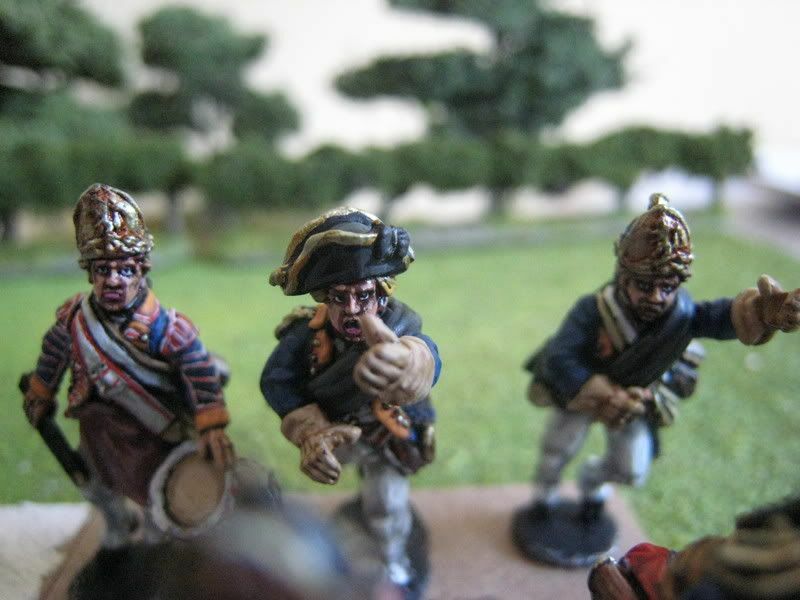 September, then, is the month of the Hessians, and I was suprised to see that I have not painted any Hessians since the von Bose last Christmas. 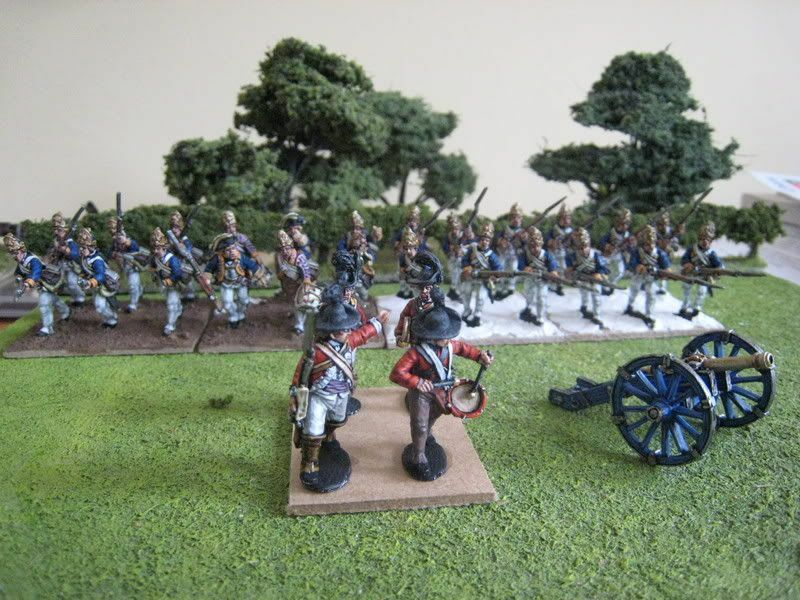 The brigade is as follows: Rall Grenadiers (24 figures), Knyphausen Fusiliers (24), von Lossberg Fusiliers (24), two 4-pounder guns and crews (8); von Mirbach personality figure as brigade commander. Rall and Knyphausen I already have, although the reason why Knyphausen's Fusiliers are not featured on this blog is because I painted all the cuffs red instead of black, and I haven't as yet changed them. If I find the time, I will do so. But that is not a priority and the next 2 weeks will see the von Lossberg Fusiliers zipping through the painting table, followed by the artillery. For the von Mirbach command figure, I will prbably use my Perry General Stirn figure or perhaps one of the Old Glory personality figures that I have. This regiment was raised in January 1777 primarily from recuits in Massachusetts and New Hampshire. From May 1777 to March 1778 it was assigned to the Eastern Department. In April 1779 it seems to have been merged with Jackson's Additional Regiment, which was then re-designated the 16th Massachusetts Regiment in July 1780. The regiment was engaged at Monmouth and Rhode Island. Colonel David Henley himself seems to have been quite a character. Born in 1749, he served on the staffs of General William Heath and Lord Stirling before being charged with forming his regiment. In November 1778 he was appointed as Washington's Chief Intelligence Officerand set to work devising a system of recording intelligence in a meaningful and constructive way. 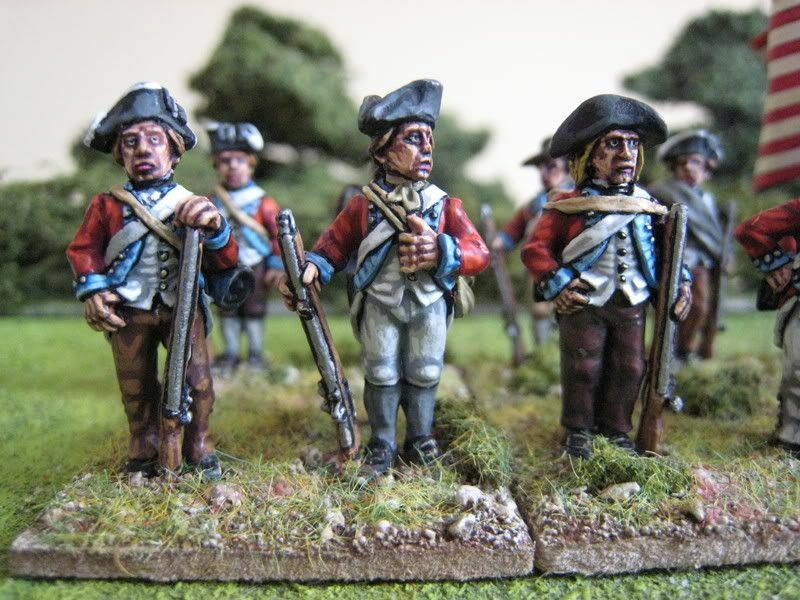 I have wanted to paint this regiment because of the rather fetching red and light blue uniforms. I finished it a few weeks ago, but couldn't decide on what flag to use. I tried to see if one of the Gostelow flags I have would be suitable, but in the end went for another Grand Union flag, if only because it sort of matches the colours of the uniforms. 16 figures. Painted August 2008. Flag from GMB. Following last week's discussion, today Dr. Eclaireur sent me a provisional orbat for the November Long Island mega-game. I call it a "mega-game" because after a couple of minutes with a calculator I realised that we will need in excess of 1,300 figures (25mm, natch), all of which will be taken from Prof. Eclaireur's and my collections. I experienced a short moment of panic when I first saw what I am responsible for, but reading the orbat through I realised that it's no so bad, and in fact perfectly manageable. What I like about games such as these is that it gives one an excuse to paint stuff that has either been hidden away in the leadpile or which ideally one would like to have, but wouldn't really bother with. The game is the weekend of 1/2 November, so I have exactly 8 weeks of painting time - that's about 80 figures' worth. I thought it might be interesting over the next 2 months to post on how the preparations are going and the various decisions that need to be made when fielding such a large collection "in public". First, the Americans. This is the easy bit, because over the past few months I have been painting all those militia and Continental units with half an eye on this game. All these regiments should see an outing (thereby condemning the American players with the "newly-painted units rout in their first game" rule). I am responsible for 3 brigades' worth, totalling ten regiments and 2 units of skirmishers. I have a few "line" graded Continental regiments, such as Hazen's Delaware Regt. which will be pretty smartish in appearance. 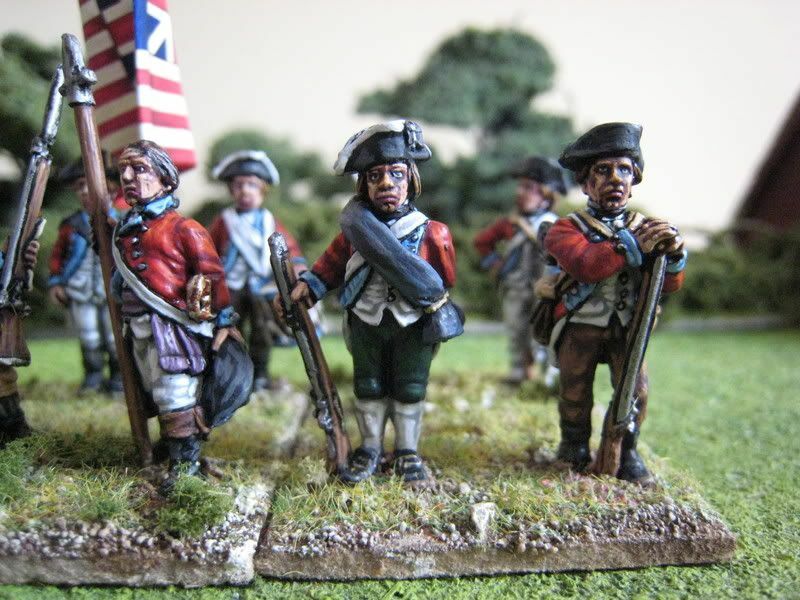 Other units are graded militia, which will allow me to field those "Southern militia" types I have been painting; a couple of these regiments are officially Continentals but are graded as "militia", so using militia figures might assist the players. 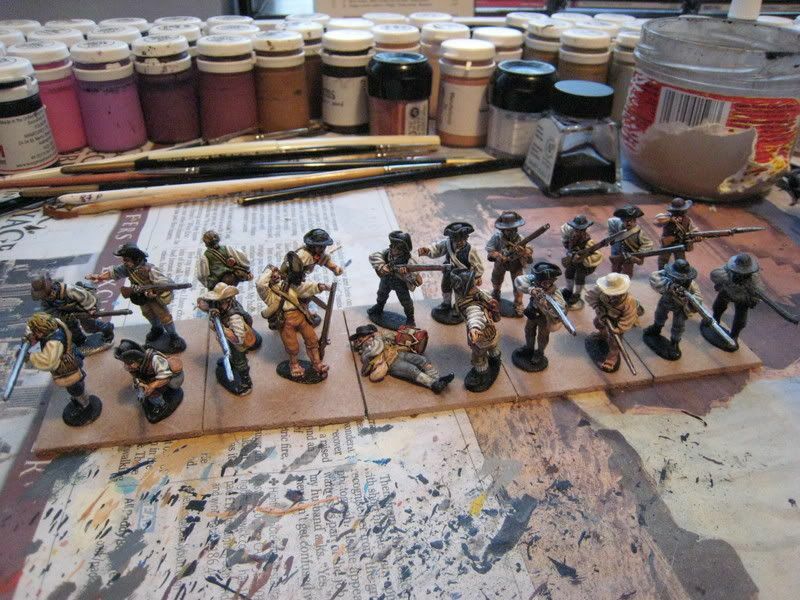 The only unit I might paint up specifically is Smallwood's Maryland regiment, which I have had my eye on for a while now. However, given the amount of British figures I need to paint, these chaps may have to wait. We'll see. I may also need to paint up some siege guns. The fortifications at Brooklyn will be represented, and they required nine guns of 12-pounder to 24-pounder calibre. So to the Brits, and here it becomes more of a challenge. I have Mirbach's Hessian brigade, comprising the Knyphausen and Lossburg fusilier regiments and the Rall grenadiers. I do not have Lossberg, so that is a priority. I also need 2 Hessian gun crews. 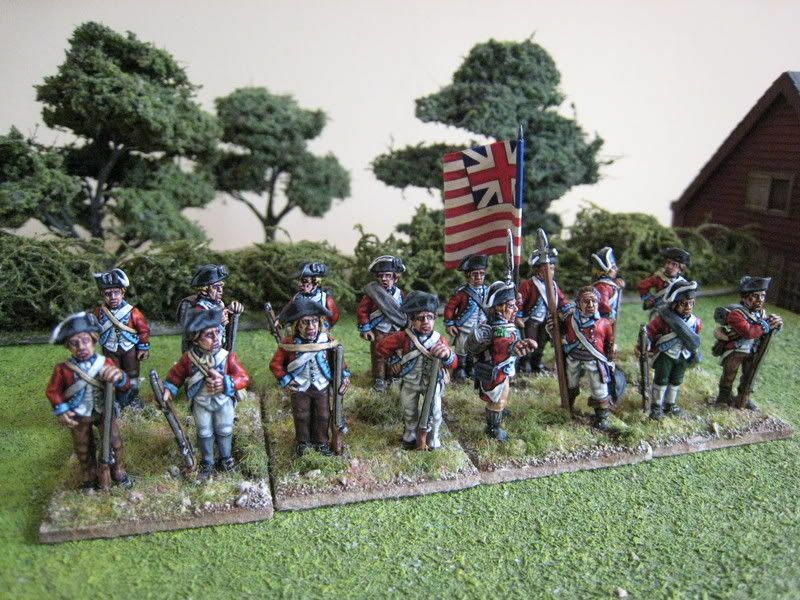 Then Clinton's flanking force: 3 battalions of light infantry; 3 of grenadiers, 1 of which consists entirely of highlanders (for which see the photo above); and Cornwallis' elite brigade of the 33rd and 71st (the 71st have three battalions here, so EC is providing the third). 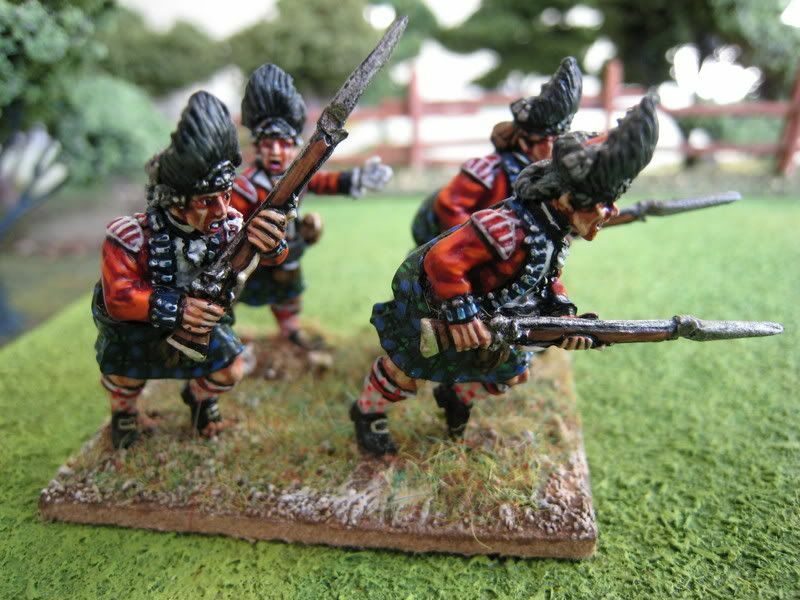 I need to paint up the 3rd and 4th Grenadier Battalions, although I have most of the highlanders for the 4th already. I will need some more light infantry too. Then we have 3 brigades from the main force: Pigott with the 5th, 28th and 35th; Jones with the 10th, 37th, 38th and 52nd; Smith with the 43rd, 54th and 63rd. Finally, Brigadier Cleaveland and his 12-pounder battery, various 3- and 6-pounder guns and the 12-figure 17th Light Dragoons. Throw in lots of wagons, ammunition carts, limbers, dragrope men, civilians, high command stands, vignettes etc, and you have my total contribution. 1) Hessian Lossberg Fusiliers (24 figures). 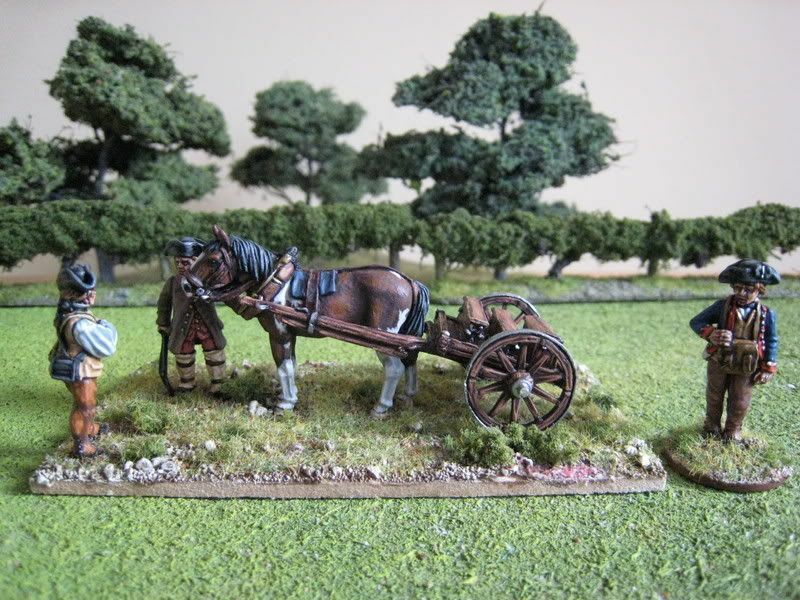 2) Hessian artillery (10 figures). 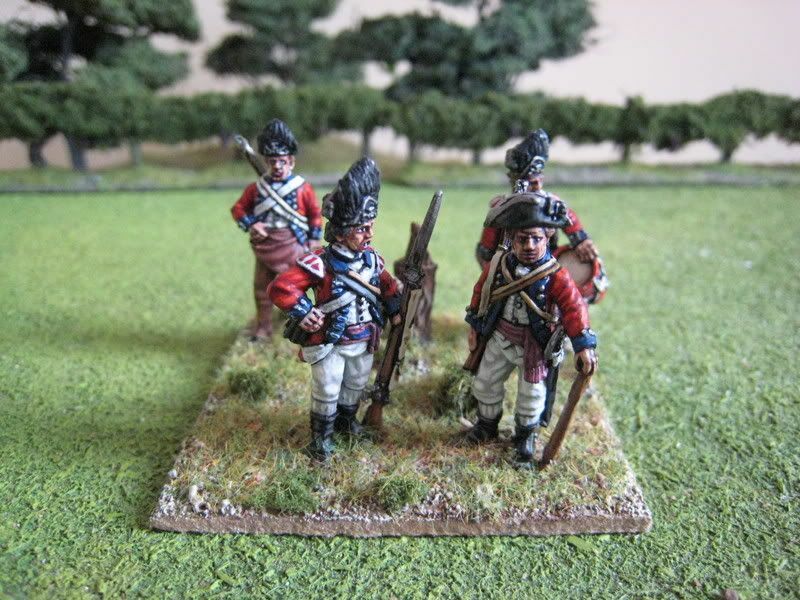 3) Grenadiers: 3rd and 4th Battalions (18 figures). 4) 3rd Light Infantry Battalion (16 figures). 5) 37th Foot (16 figures). 6) 22nd Foot (16 figures). 7) 54th Foot (16 figures). 8) Smallwood's Marylanders (24 figures).